Location The Georg-August-Universität Göttingen was established in 1737. It is an internationally accredited research university and part of a world- wide network of science and learning. More than 40 Nobel laureates are associated with Göttingen. 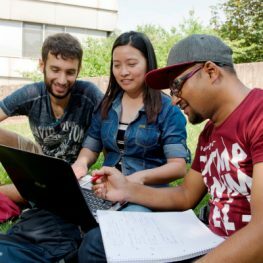 The university offers courses in a broad range of disciplines including philosophy, economics, agriculture, biology and geography and is among the top universities in Germany. The city of Göttingen is situated in the geographical centre of Germany. The Georg-August-Universität Göttingen with more than 25,000 students is an integral part of the city and contributes considerably to the young, lively atmosphere of the town. Due to its central position in Germany, Göttingen has excellent intercity transport. Within two hours you can be in Berlin, Hamburg or Frankfurt by high-speed train. Course focus The M.Sc. course Tropical and International Forestry provides advanced study in management and conservation of tropical and sub-tropical forest ecosystems. It especially focuses on the ecologically and economically sound management of forest resources and tree-based land use systems. The targeted ecosystems and management systems include natural forests under full protection, close to nature forestry, plantation forestry, agroforestry systems and trees outside the forest. The programme is for students interested in pursuing an international career in forestry, nature conservation, ecosystem research or rural development. The M.Sc. course is a two-year programme with a modular structure. The first two semesters consist of lectures and course work in Göttingen. The modules address topics such as Tropical Silviculture and Forest Ecology, Tropical Soil Science, Forest Resource Assessment, Bioclimatology and Global Change, International Forest Policy and Economy, and Project Planning and Evaluation. Elective modules can be chosen either from the Faculty of Forest Sciences or from other faculties and Master’s courses, such as Agribusiness or Biodiversity and Ecology. This helps students to specialise and develop an individual profile. In the third semester a student project is conducted, which often includes field studies abroad and uses an interdisciplinary approach. The fourth semester consists of the preparation and defence of the Master’s thesis, which is based on own supervised research. Target group Graduates in forestry or other related disciplines (e.g., agriculture, biology). Remarks The Master’s course is fully accredited and has received high evaluation scores from its former students.